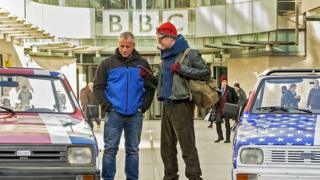 A BBC boss has said claims about Chris Evans's behaviour while filming the new series of Top Gear are "rubbish". Acting director of BBC Television Mark Linsey added that it was "simply not true" that Evans was against the appointment of Matt LeBlanc. LeBlanc joined the programme's presenting line-up earlier this month. His comments follow reports in some newspapers that executive producer Lisa Clark left Top Gear after just five months due to Evans's behaviour. When she left, Clark said she was "moving on to new projects", and added: "I'd like to wish production all the very best with the show." In a statement, Mr Linsey said: "It is rubbish to suggest Chris Evans' behaviour on the set of Top Gear has been in any way unprofessional. "Chris is a consummate professional and a real team-player. He is a passionate presenter who commits his heart and soul into everything he does - whether his Radio 2 show, Children In Need or Top Gear - and we are extremely fortunate to have him leading the show. "Also, it is simply not true to suggest Chris did not support the signing of Matt LeBlanc, when he has been behind Matt joining the presenting team since day one. "Chris and Matt are part of a wider production team that is full of brilliant and talented people. That team is tight-knit, in great spirits and utterly focused on delivering the best possible series for viewers." Chris Evans - who also presents the Radio 2 breakfast show - has replaced former lead presenter Jeremy Clarkson on the programme. Last week, Clarkson apologised to the producer he punched during filming last March - an incident that led to his sacking. Clarkson and the BBC are reported to have paid more than £100,000 to the producer, Oisin Tymon to settle a racial discrimination and personal injury claim. The altercation occurred after Clarkson reportedly flew into a rage after being told he could not order steak after a day of filming in North Yorkshire. Clarkson was removed from Top Gear's presenting line-up following the assault, and his co-presenters James May and Richard Hammond also quit the show. The trio have now signed up to launch a rival show on Amazon's TV service.